Swiss watch manufacture Christophe Claret presents the Baccara, a spectacular timepiece inspired by the world of casinos. Following the foot steps of DualTow, Adagio and 21 Blackjack, the playful & interactive timepieces developed and created by Manufacture Christophe Claret , the new model doubles as a miniature casino with three games: baccarat (‘baccara’ in French), roulette and dice. It took almost one year to create the exclusive movement that gives life to this micro mechanical wonder. The special sapphire crystal protecting Baccara’s dial which, when blown upon, reveals a secret, talismanic Chinese ideogram. Within its precious case Baccara houses a veritable mini casino comprising baccarat, roulette and dice, all requiring exceptionally complicated micro-mechanics in addition to those providing the traditional time indications of central hours and minutes. 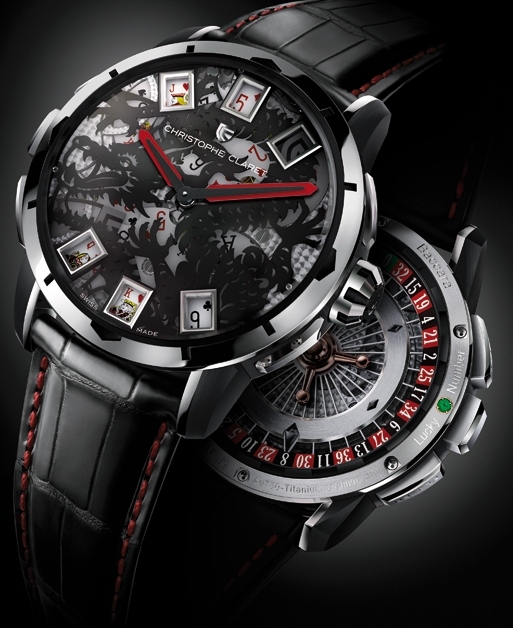 The baccarat cards appear on the dial as if by magic. At 6 o’clock, the player’s cards are distributed in three small windows edged in either rhodium or red gold, depending on the version. The banker’s cards are at 12 o’clock. To shuffle the cards, the player presses a pusher located at 9 o’clock, which arms a spring, which then simultaneously turns three gold discs on which they are printed. At 8 o’clock, the pusher allows the cards to be distributed to the player. Finally, at 10 o’clock, a third pusher organizes distribution to the bank. Every time the shutter opens, for either the player or the bank, a Cathedral gong is struck and this wonderful striking mechanism can be seen through a lateral window at 2 o’clock. 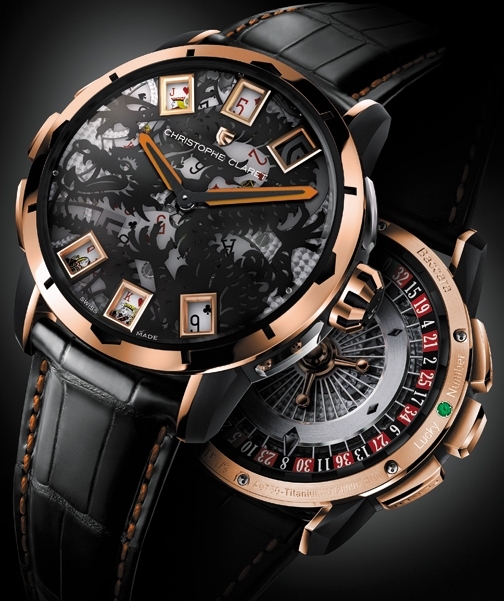 It is the sheer complexity of Christophe Claret’s movement that makes it possible to have an authentic game of baccarat, as if the wearer was in a real casino. As the bank and the player have 252 different card combinations available to them, there are exactly 63,504 game possibilities. Or, more precisely, as the player and the bank do not necessarily draw a third card, there are 24,774 different game possibilities. Statistically, the player has 29,731 chances of winning (46.82%) and the bank 28,039 (44.15%). There are 5,734 chances of a draw between the player and the bank (9.03%). Baccara also gives the wearer the chance to experience the thrills and spills of the craps table: a pair of delicately crafted dice measuring 1.5 mm on each side is housed in a cage at 4 o’clock and visible through a lateral window in the case band and rolled by a simple shake of the wrist. Turning over Baccara reveals the winding rotor, visible through the anti-reflective sapphire display-back crystal and serving as the roulette wheel on which an arrow indicates the winning number. Finally, Baccara owners will have the option of having their own lucky number engraved on an emerald set in the watch. To protect and enhance the Baccara’s exclusive calibre, great attention has been given to the minutest details of the 45mm case. It is available in three versions: white gold and grade 5 black PVD titanium; red gold/grade 5 black PVD titanium; and platinum/grade 5 black PVD titanium. 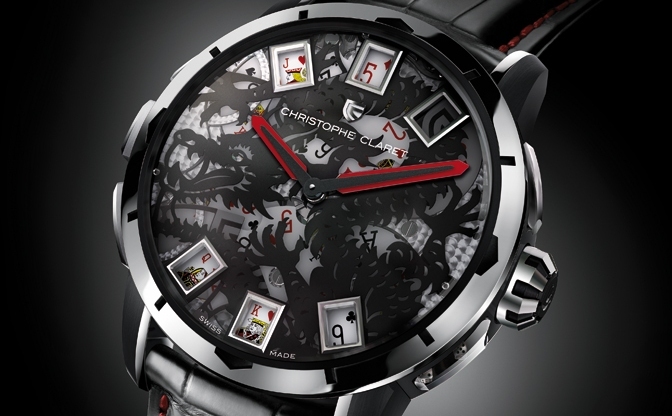 Baccara’s dial is completed by an eye-catching silhouetted dragon or tiger, in between the two sets of card windows. Laser cut in a jade or black titanium plaque, this legendary creature and renowned symbol of luck appears to be protecting both the timepiece and its owner. On the sapphire crystal, the lucky Chinese ideogram is revealed when blown upon the watch, appearing in the mist as if by magic and remaining for several seconds; a little ritual that should not be missed, not only by superstitious players before beginning their round of baccarat, but indeed by anyone wishing to start their day on a good note. This secretive ideogram is produced through a metallization process of the sapphire crystal, especially developed for Christophe Claret and it was an idea that came to the master watchmaker during his trip to Macao.